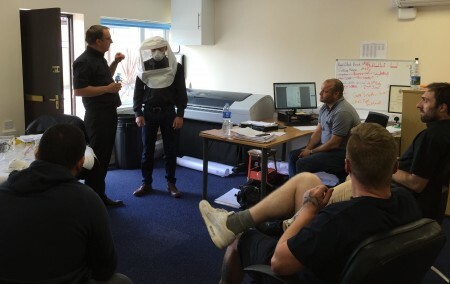 Dave Watson, our Health and Safety Manager, visited our Brentwood Office to train our Project Managers on face-fit testing. HSE approved code of practice requires that face-fit training be carried out as part of the Respiratory Protective Equipment (RPE) selection process. Face-Fit testing is a method for checking that a tight-fitting face piece matches the persons facial features and seals adequately to the wearers face. On completion of the training our Project Managers were able to carry this out on site with our engineers. This exercise will be carried out for initial RPE selection and kept up to date to assure masks are appropriate for the wearer and serving their purpose.